Sat., July 23, 2016, 8:40 a.m.
A GRIP ON SPORTS • It's Ken Griffey Jr.'s weekend in Cooperstown, N.Y. The Hall of Fame. The Mariners' first player. What does it mean? More importantly, what did he mean to our area? Read on. • There was a little dustup this year concerning Steph Curry, when former NBA player and coach Mark Jackson made some remarks about Curry ruining basketball. His point was simple: Curry did things others couldn't, but that didn't stop young players from trying to emulate him. And they all would fail. Well, that's old news. When Griffey was dominating the American League in the 1990s, a whole generation of youngsters saw his sweet swing and decided, "hey, I can hit like that." Except they couldn't. Griffey was one-of-a-kind. 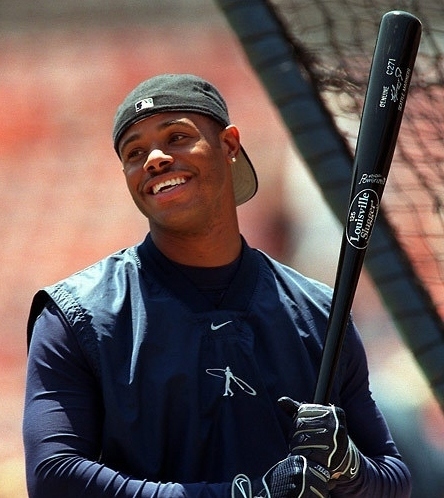 His swing was beautiful, sure, but worked because Griffey was exceptional at what he did. For most hitters, getting the bat to the ball as quickly as possible means their stroke had to be short. Edgar Martinez was a good example. He was, in baseball parlance, short to the ball and long through the zone. That means the barrel of the bat got to the strike zone quickly and then stayed there a long time. Griffey did the same, but the length of his swing was so much longer it created almost unlimited power. The bat speed was tremendous and something every player pined for. Even guys who had made it to the pinnacle, the bigs, tried to do what Griffey did. None could. But in backyards all over the Northwest, kids were turning their hats backward – boy did my dad not like that – and trying to swing with Griffey's long arc. I saw it first hand. Some were able to master the stroke and it looked like a piece of art. The problem was none of them were Junior, and that made all the difference. Like all geniuses, Griffey was unique. Only he could paint with his brush. Others were just imitators. None of this was Griffey's fault, of course. He was truly special as a hitter. And as a centerfielder. And, with the smile that said he enjoyed playing the game, as an ambassador. He was just on a pedestal above. Tomorrow, his bust goes on a wall in Cooperstown. He will speak. He will be inducted into baseball's Hall of Fame. He earned it. Now that's what the Northwest's youth need to strive to emulate. • And the backward cap? That's another trend you can thank – blame? – Griffey for. Before he came along, it was easy for coaches to tell kids, respect the game and wear your cap right. That argument went out the door with Junior. A son of a former big leaguer, it was obvious he respected the game. It's just he liked to wear his hat backward until the game started. So what's the big deal? Well, the cheap imitators followed along again. How you wore your hat during games became an expression of individuality in a team sport. Cocked to the side, turned askew, whatever. If Griffey could pull it off, why can't I? Except Griffey, as his career numbers show, could pull off a lot of things others couldn't. He was a trailblazer at the plate and in the clubhouse. And he was a Seattle Mariner. Sunday, he becomes a Hall of Famer. • WSU: Is Washington State's 2016 football team under-hyped and under-appreciated? Does it matter? Ted Miller examines this in his mailbag on ESPN.com's Pac-12 blog. The blog also looks back at the coaching tenure of former Stanford mentor Dennis Green, who died Friday. • Gonzaga: Few Good Men, the Gonzaga alumni team, lost to Team Utah 93-81 in the Sweet 16 of The Basketball Tournament. ... Two friends will begin a Bay Area rivalry this basketball season. • Indians: An error-filled eighth inning cost Spokane a share of first place in the NWL's North Division, as it lost 8-6 at Boise. ... Tri-City got past Hillsboro 2-0 to take over first place alone. Everett and Vancouver both lost. • Empire: The Indoor Football League title will be decided in tonight's United Bowl at Sioux Falls. The Empire are a decided underdog to the host Storm, winners of the last five IFL titles. Jim Meehan has an advance. • Chiefs: Spokane continued to shore up its roster with another signing. ... Everett traded its captain. • Golf: Jim Meehan catches up with a couple of local guys on the professional circuit, Alex Prugh and Joel Dahmen. • Mariners: Don't forget one thing Griffey did for Seattle and the Northwest: He may have single-handedly saved the Mariners for the area. Remember, they almost moved to Tampa. ... The M's won 2-1 yesterday behind the stellar pitching of James Paxton. It would be nice to be able to write that a bit more often. ... Ketel Marte did not play. He has mono and will be out a while. Luis Sardinas was called up to fill in. • Seahawks: Will Justin Britt finally find a home at center? • Sounders: The July transfer window is half closed and yet the Sounders have done nothing. Should they buy or sell? ... Real Salt Lake has four consecutive draws at home. ... The L.A. Galaxy has improved its defense.